To download a PDF of this article, please click here. Nearly one month after de facto President of Brazil Michel Temer issued an emergency decree that placed the Rio state police under control of the military, councilwoman Marielle Franco was killed under mysterious circumstances on the night of March 14. [i] Franco was a feminist activist who fought for black rights and was an outspoken critic of the military intervention in Rio and police brutality. [ii] Although no arrests have been made, the assassination appears to be a targeted silencing of a dissenting voice. The military intervention currently underway in Rio de Janeiro was initiated on February 16, 2018 and effectively placed the state police force under the direct control of the armed forces. 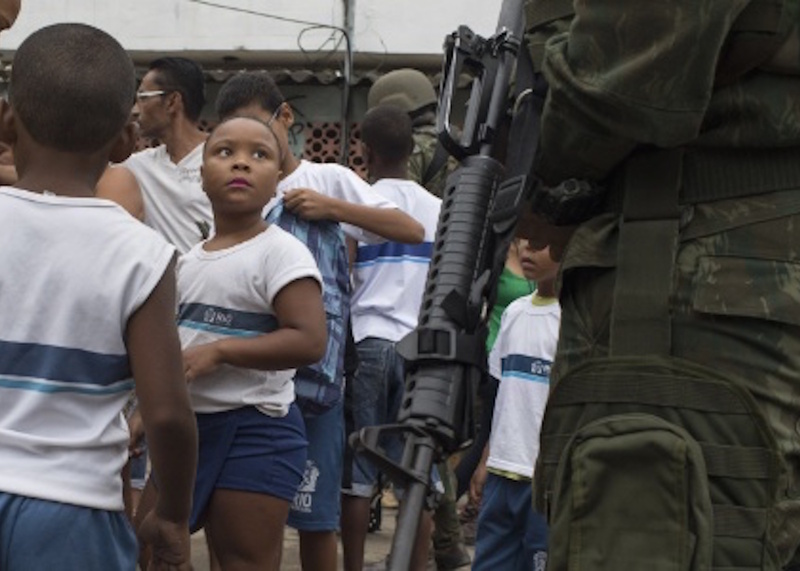 [iii] On February 23, a stark scene was presented when Brazilian military personnel approached residents on the streets of some of the poorest communities in the West Zone of Rio de Janeiro with a list of suspects in hand. Members of the military forces used their cellphones to photograph local residents holding their identification cards, and then forwarded the resulting photos to the Civil Police in order to check whether or not the residents had a criminal records. [iv] Army Colonel Carlos Frederico Cinelli stated that this unusual measure was not only legal but time-effective, ignoring that such “time-saving” efforts could result in the criminalization of entire communities whose inhabitants are almost always poor and non-white. [v] This invasive maneuver which documented citizens’ identification and image is just another harsh aspect of life under the new norm of increased military presence in Rio that many residents have had to submit to. Although the military intervention has had the support among the right wing of the upper and middle classes, the lower class, which is most directly affected by the increased presence of the police in their neighborhoods, express doubt that the action will result in a significant decrease in crime. [xxii] The upper and middle-class Brazilians who support increased military presence live in the wealthier neighborhoods that already have less policing, and their support could stem from a desire to protect their personal property. The inhabitants of the poor communities are predominately black and more likely to suffer from indiscriminate police brutality than are other segments of the population. In a February 27 interview with the British The Guardian, retired Army General Gilberto Pimentel expressed sympathy for the army’s dilemma in identifying who the criminals are, stating “we are going to operate in communities that are dominated by the bandits. It is very difficult to separate the good people from the bandits.” [xxiii] This statement is highly disconcerting and it reveals dangerous prejudices held by members of the military that are bound to contribute to the criminalization of entire communities, which can lead to human rights abuses and the death of innocents among a segment of the population. For many Brazilians, the increased role of the military in Rio carries uncomfortable echoes of the military dictatorship, which ruled Brazil from 1964 to 1985. [xxvii] Under a new law passed in October of 2017, members of the armed forces who kill civilians can only be tried in the notoriously non-transparent military courts, a decision which could increase impunity for the military’s human rights abuses. [xxviii, xxix] Although the current political and economic crisis in Brazil may overshadow the unsettling news of the military intervention, it is evident that the current trend is of major concern for defenders of human rights and points to a wider trend of militarization of police, racism, and a lack of checks and balances in Brazilian politics and civic society. Additional editorial support provided by Aline Piva, Research Fellow, Liliana Muscarella, Extramural Research Fellow, and the Research Associates João Coimbra Sousa and Keith Carr at the Council on Hemispheric Affairs. COHA is a non-profit organization. We depend on the support of our readers to help us keep our organization strong and independent. Please consider supporting our work with a subscription to our Washington Report on the Hemisphere or by making a donation. Did you enjoy this Article? Subscribe to our mailing list for more just like it.